Last week-end I attended a cookery class at The Black Cat Café & Bakery, a popular spot in the village of Sharon Springs, New York. Owner Tony Daou recently remodelled the café’s second floor, adding a professional kitchen for classes as well as walls sheathed in a swell hand-blocked wallpaper by Adelphi Paper Hangings, another local business. (The custom-colour pattern is Spiral Willow, a 1920s French design you can see on the company’s website.) 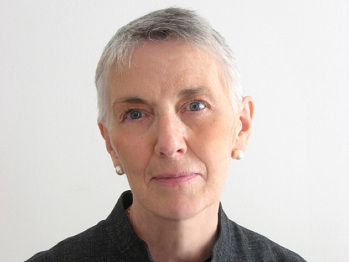 The teacher of the class was Judith Choate, author of more than 60 cookery books, everything from a primer on pastry-making to a soul-food collaboration with Patti LaBelle. She and her husband spend week-ends in the area and are Black Cat patrons. And though “The Aesthete Cooks” focusses on explorations of vintage cookery books, ie usually those published prior to 1970, I found the brochure Judith Choate handed out before the class to be so incredibly practical that its contents should be shared. The class was entitled “Eat Better, Spend Less” and needs no more explanation than that. But her discussion of how to shop in order to make the most of your food budget was valuable. Here are Choate’s eight smart suggestions. Some you likely already know; others might come as a surprise; all should be tacked up in the kitchen as a daily guide. Make-ahead meals are simply the most economical way to feed your family and to minimize kitchen time for the cook. They require purchasing in bulk and creating a number of meals out of one main ingredient. This is an especially great tactic when the main ingredient is purchased on sale or discounted at a big box store. 2. Think seasonally and locally. Almost all produce is less expensive when purchased during its season, particularly when found at local markets or farm stands. As well, many chain supermarkets now feature homegrown products as a way to support community farmers, cheese maker, bakers, and so forth. Many meat products are also less expensive during a particular season; think of lamb in the spring or turkey around the fall and winter holidays. 3. Think outside the normal dinner box. You don’t have to have the traditional protein, starch, and veggie on every plate every night. Think about a nutritious frittata, a mixed-up salad, unusual grains tossed with legumes or vegetables. And what about breakfast for dinner? Multigrain waffles with sautéed mushrooms instead of sweet waffles with maple syrup—although when I was a child sweet waffles were my special dinner treat and there’s no reason they still can’t be. 4. Use less animal protein. If you have a family of meat eaters begin to, at the least, serve smaller portions. Introduce ethnic meals that use less meal with wonderfully tasty success. I’m not a great lover of tofu, but have learned to like it well enough to use it often in place of meat. There are a multitude of ways to heighten flavour and satisfy the palate without piling on animal-based proteins. 5. Never throw food away. As soon as your meal is over, prepare any leftovers for use in another meal, even if it’s just a few vegetables that can be tossed into tomorrow’s salad or a bit of meat that can be chopped up to make a sandwich. It takes just a moment to do—the same time it takes to scrape the plate into the garbage. 6. Keep a well-stocked pantry. This is probably one of the most important aids to saving money while preparing great meals. … A well-stocked pantry eliminates last-minute, impulse shopping as well as gives you the ingredients to make the most with what you have on hand. 7. Prepare foods you enjoy. Although it always makes sense to begin with ingredients and dishes you and your family enjoy, sneak new, interesting and cost-effective ingredients into the norm as a way of expanding your opportunities to create less expensive meals. 8. Do peruse local newspaper ads. Although you may not have the time to cut coupons or go from store to store on a bargain hunt, do check supermarket ads as many stores will often feature the same “specials” which will help trigger some plan-ahead ideas for the week’s or month’s meals. 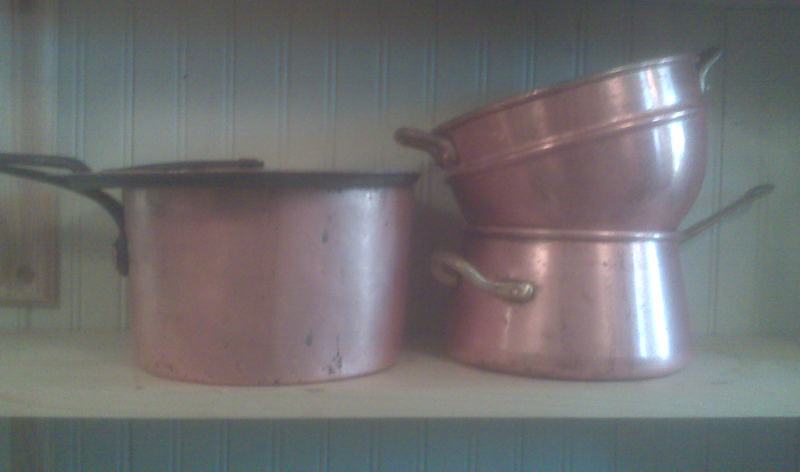 One of the least desirable household chores around our place is polishing copper pots. We possess about a dozen, from mignon to massive, and use them constantly. We’re a little lazy, however, when it comes to breaking out the Brasso Multipurpose Metal Polish. Polishing is hard, dirty, and arm-aching. And no matter how diligently we work at the task, the pots never take on a perfect shine. Well here’s a hint my husband discovered over the week-end: use common white vinegar rather than metal polish. No, not for rubbing; for boiling! Onto the stove he placed a very large, very deep enamelled metal pot, the kind most people would use to make, say, industrial-strength-size amounts of soup or stew. Then he set one of our tarnished copper pots inside it, poured a gallon of white vinegar over it and added enough water until the pot was thoroughly covered with liquid. After that he turned on the stove, allowing the vinegar-and-water mixture to come to a merry boil until the tarnish came off, along with any grease deposits hidden in the joints of the handle, et cetera. As the liquid boiled down he simply added more water until the pot shone like a new penny and was ready to be rinsed and dried. He reused the vinegar-water mixture for every successive pot. Of course when I got home the kitchen smelled like he had been canning pickles all day, but every one of those tarnished pots sparkled (a sampling is shown above). If you plan to do this, however, I’d advise opening a window. Life has been a little hectic on our blustery hilltop of late, which explains for the recent paucity of posts. My apologies for that, and I’ll try to do better. Now that the apologies are out of the way, might I tempt you with some fragrant strawberries? I know they’re not in season right now and the department-store variety can be imperfect but my husband recently came across a recipe for a strawberry tart in one of our favourite vintage cookery books and couldn’t help making it for dessert a few days ago. Having been educated in France and Switzerland he has a weakness for Gallic culinary delights and often turns to La Cuisine de France by Mapie, Countess de Toulouse-Lautrec (Orion Press, 1964). I think it’s likely his favourite cookery book. The dessert section is quite tempting, filled with all manner of delicious possibilities. 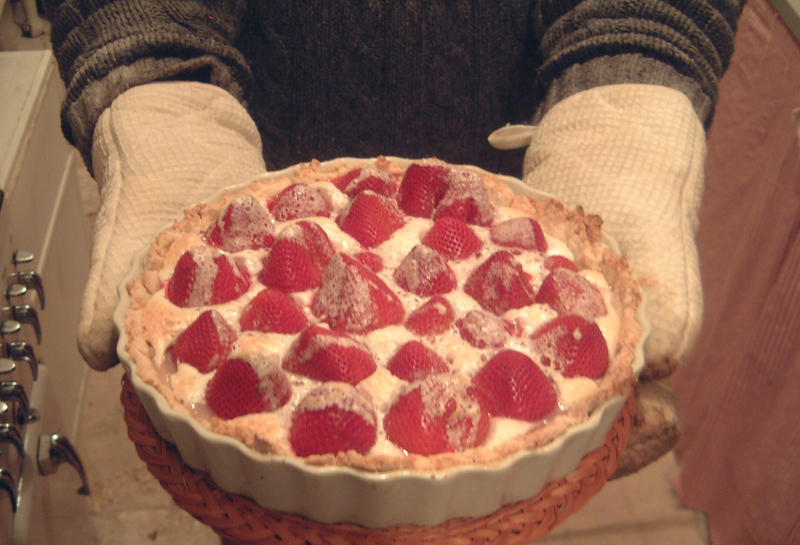 Strawberry Meringue Tart, or Tarte aux fraises meringuées, is very easy to make, and it includes a step—the arrangement of the strawberries—with which our daughter, Catherine, could help. She’s pretty good in the kitchen, though she claims she most enjoys washing dishes. The tart was incredibly good, and the next morning, I even had a slice with breakfast. Heap the well-mixed flours on a working surface and fashion a well in the center. Into the well put the sugar, salt, egg, and slightly softened butter cut in small pieces. With your fingers gradually work the flour toward the center and add just enough water, teaspoon by teaspoon, until you have a very smooth and shiny ball of pastry. The pastry has to be kneaded slightly, but do it no longer than necessary. Let this pastry rest for several hours before using. Arrange the strawberries, pointed side up, in the tart. Beat the egg whites stiff and fold in the sugar. Spread the meringue over the berries [evenly] and bake at 300 degrees Fahrenheit for 15 to 20 minutes or until the meringue is lightly browned. 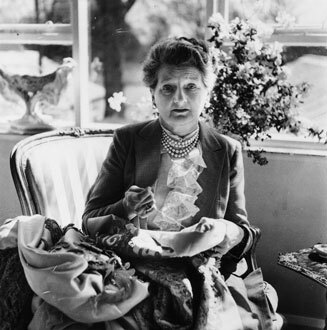 Constance Spry, British floral expert and co-author of "The Constance Spry Cookery Book." Last Saturday evening we were invited to dine at a friend’s house in a nearby village, so my husband baked the fourth in our series of seed cakes to bring as a hostess gift. It looked a little strange, due to a kitchen mishap involving the candied-caraway-seed garnish (more on that below) but despite that, it was terrific. The entire cake was devoured during the cocktail hour by the assembled guests, who included designer Rico Espinet, his wife, and their two children. Spry and Hume’s seed cake is one the authors call “a good old-fashioned seed cake.” It was different from our previous experiments, however. For one it included candied orange peel. For another the top of the cake was supposed to be sprinkled with “a handful of caraway confits.” A footnote explained these are “sugared caraway seeds and may sometimes be bought at the confectioner’s. They may be replaced by roughly crushed lump sugar.” Instead my husband tried to candy the caraway seeds himself, the same way he candies orange peel; the decision was not exactly a success, since the seeds clumped together with the sugar and had to be crumbled. In the oven the crumbles melted and gave the top of the seed cake a sweet but blotchy surface. Oh, well; the taste was wonderful nonetheless. Sift the flour and beat into it the butter until it is a creamy consistency. Add the sugar gradually and beat to a fine white cream. Separate the yolks from the whites, beat in the yolks one at a time, with a teaspoon of flour added before each yolk. Add the candied peel, the grated nutmeg, and the caraway seeds. Whisk the egg whites and fold them into the mixture with the remaining flour. Lastly stir in the brandy. Put the batter into a well-greased loaf tin. Strew over it the comfits and bake for an hour or until a skewer or toothpick poked into the center comes out clean. 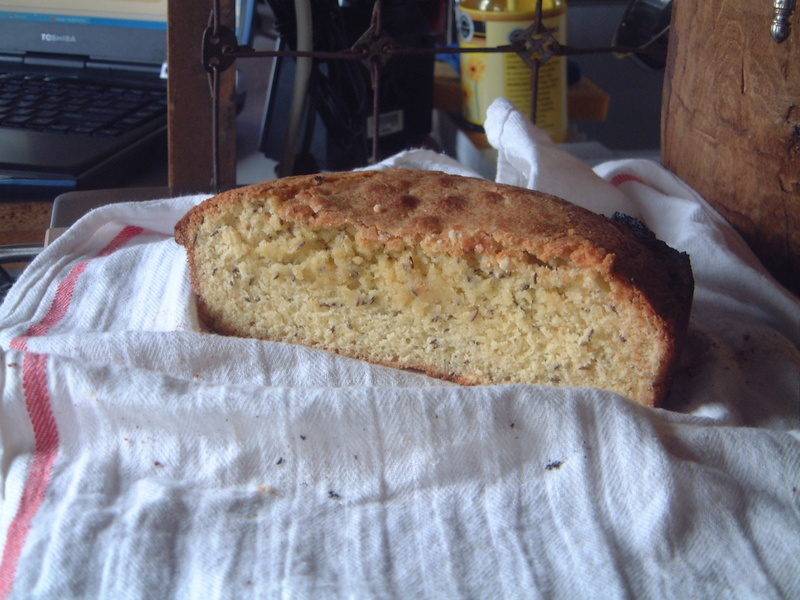 A caraway-packed seedcake courtesy of James Beard, though the recipe comes via his mother's brilliant Cantonese chef. Overlook the toasty edges; we certainly did. Our vintage oven needs its temperature settings adjusted. 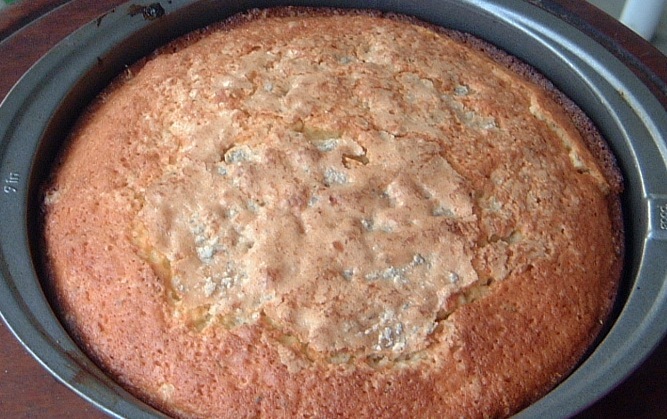 Let’s oh-so-English recipe makes a mighty good seed cake, the best I have ever eaten. And I mean with all the enthusiasm I can muster. It is moist and flavourful and packed with caraway seeds. That being said, a woman friend who tried a slice declared it to be a bit too assertive. Our post-baking male guinea pigs, on the other hand, finished the rest, leaving barely a crumb behind. 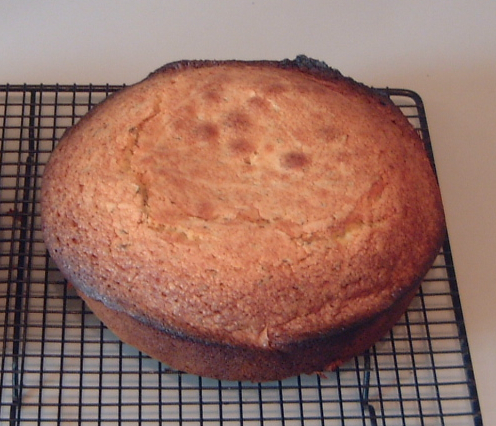 A cross section of Beard's seedcake, cut shortly after it cooled. The center top remained a smidgen undercooked, despite the perfectly followed directions. Once again, blame our oven. Nonetheless every bite was fantastic. This one's a keeper. Butter an 8-inch round cake pan, cover the bottom with wax paper, and butter the paper. Thoroughly cream butter with sugar. Beat in eggs, one at a time. Stir in the caraway seeds. Sift the flour, baking powder, and salt, and gently fold into the butter-egg mixture. Spread the batter in the pan and bake in the oven for 1 hour or until it begins to shrink from the sides of the pan and is firm to the touch [and when it tests done with a straw or toothpick]. Let cook in the pan for 2 to 3 minutes, then turn out on a rack, peel off the paper, and let cool completely. Let Me in The Kitchen!